Mumbai: Demand for gold exchange traded funds (ETF) in India is likely to “explode" as investors get accustomed to “click-and-park" mode of investing, shying away from sagging stock markets and as high inflation eats into bank savings, a trade body head told Reuters on Thursday. “Clearly people are seeing convenience in the form of ETF, going through the same broker which he has for equities," said Ajay Mitra, managing director - India and the Middle East, World Gold Council (WGC). In the last four years, volumes in gold ETFs have grown over 164 %. Mitra said another reason for the attractiveness of paper gold is that unlike in jewellery there is no intermediate costs. Currently, volume in gold ETFs in India, the world’s largest consumer of bullion, is more than 15 tonne--minuscule compared with the country’s annual physical gold demand of 900 tonne. Gold prices in India have gained 29% since the start of the year, compared with just 15 percent gains in the stock market . The WGC is working on a number of gold-based investment products, but they are still at the “concept stage". “It is still work in progress. The government is looking at various options to fund the economy," said Mitra. He, however, declined to give details. The council expects gold prices on India Multi Commodity Exchange to stabilise in between ₹ 27,000 and ₹ 28,000 ($549-$569) per 10 grams in October. This will boost demand during Dhanteras, the biggest gold buying festival, along with Diwali. “There has been marginal build-up (in inventory) but September has also been bad month from volatility point of view," said Mitra. With volatility at 21%, retailers had not stocked up, while other consumers were “not sure if tomorrow’s price is better than today". “The trade is optimistic that we will see a better Diwali this year... but they are still a little sceptical of the volatility in prices and they want volatility to ease off a bit. 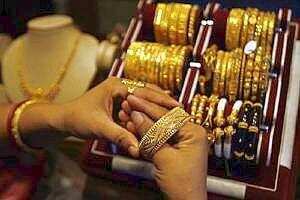 Demand is there and price is not the factor as consumers are aware of the returns that gold has given," said Mitra. India gold demand rose 37% to 284.9 tonnes in the last quarter of 2010. “There is latent demand and the conditions are conducive for cause and case for gold. As inflation rate is high, real interest rates is negative," Mitra added. Food price index rose 9.32% and the fuel price index climbed 15.10% in the year to 1 October. The stubborn inflation has prompted the central bank to raise interest rates a dozen times in the past 18 months and its key policy rate stands at 8.25%. The WGC said the flow of scrap, which is the raw material for gold refiners in India, has dried up.